Asian nations show the way as major powers dither and hesitate to commit at the United Nations Framework Convention on Climate Change (UNFCCC) in Cancun, Mexico. Words by Jeremy Torr. Singapore, 15 December 2010. While global leaders vacillated and stepped back from signing another Kyoto accord to limit emissions, 120 key participants from government, civil society and the private sector organisations across Asia sat down at Cancun to take something positive home from the conference. “Aggressive measures are already being taken by countries in the Asia Pacific, but these efforts are often missed in the wider international dialogue,” asserted Dr. Ursula Schaefer-Preuss, Vice President, Asian Development Bank (ADB). She noted that with the world’s largest climate-vulnerable population, Asia’s efforts to mitigate greenhouse gases and strengthen resiliency deserve much more recognition than they get. Representatives from the People’s Republic of China, Indonesia and Pakistan gave presentations that demonstrated where they have made progress and how financial and analytical support could enhance the mainstreaming of climate change into development planning. Cancun delegates managed to produce as many emissions as a small country during the conference. In stark contrast, Hillary Clinton, Secretary of State for the U.S, noted that: “over the last year, the United States has worked with our international partners to build on the progress achieved at the climate change conference in Copenhagen.” Which most would agree was very little. The Asian grouping, convened by the Institute for Global Environmental Strategies (IGES), the Asian Development Bank (ADB) and the National Institute for Environmental Studies (NIES) held its “Shifting to a Low Carbon and Climate Resilient Development in Asia and the Pacific”, event alongside the main UN event. It highlighted that a growing amount of analytical support in Asia is coming from research on low carbon societies. NIES, together with partner institutes in China, India and elsewhere in Asia, presented low carbon scenarios and visions to achieve low carbon societies. Oxfam made a massive message in a bottle for world leaders at Cancun. Not sure if it made it to their beach. 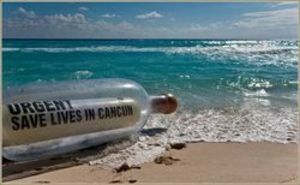 Oxfam made a massive message in a bottle for world leaders at Cancun. Not sure if it made it to their beach.“Whether it be co-operation on economic analyses, new policy mechanisms like REDD+, or adaptation strategies, we must recognise natural synergies between multilateral finance institutions and strategic research institutions (in Asia),” noted Professor Hamanaka, Chairman of the Board of IGES. In fact the WWF had already noted before the conference that it would likely be up to the smaller players to make something happen. The Foro Verde stadium in Cancun was built with 1,000 visitors in mind. Let's hope they didn't all arrive by plane. The Foro Verde stadium in Cancun was built with 1,000 visitors in mind. Let's hope they didn't all arrive by plane.With Japan also backing away from another Kyoto agreement, it seems smaller Asian nations will have to take up the baton. IGES presentations on CDM reform, measuring, reporting and verifying greenhouse emissions, and work as secretariat for the International Research Network for Low Carbon Societies (LCS-RNet), offered practical recommendations for making those visions tangible in Asia. “If (we) wait for the US (we) will be accepting the economic and social consequences of climate impacts. Cancun is where Governments need to regain their momentum in a race to the future and if the US doesn’t want to join, then perhaps others need to move on,” asserted Greenpeace’s Trio. According to some reports, the entire Cancun conference generated a staggering 25,000 tons of CO2 - as much greenhouse gas as Laos might over the same timeframe. Admittedly, the organisers pledged to plant 10,000 trees to offset the emissions. If it wasn’t for the IGES event, Cancun might just have been a lot of hot air.